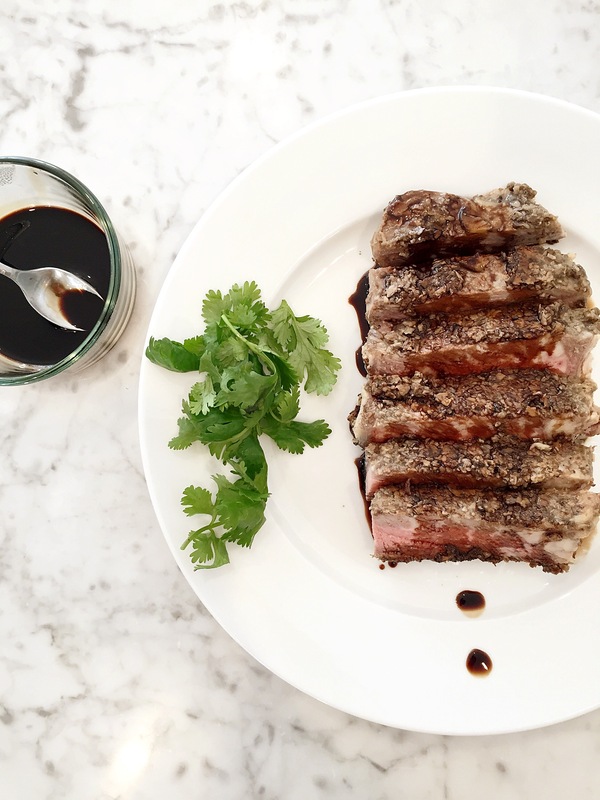 Delmonico Steak with mushroom crust | The Bee's Kitchen: Tasty. Home. Cooking. Slice the mushrooms very thin. Heat up olive oil in a large pan and sautee the mushrooms with salt and pepper for about 9-10min. When cool down, put them in the bowl of the food processor and pulse a few times. Rub one tbsp of olive oil onto the steak. Spread the mushroom mixtures on both sides of the meat. Heat up 1 tbsp of olive oil in a large pan and seared the steak for 7 to 8 minutes on each side. Place in the oven on 350 covered for 20 minutes. Heat up the balsamic vinegar and simmer until it’s reduced by half. Pour over the steak. In always in a for a yummy meat recipe like this one! Yum! Question; can I make this with any other meat? If so which ones? Hi! You can use any steak that is thick enough for the crust and seat it on the pan. Like filet mignon, boneless club steak. I ve made both and it worked out great. Same for lamb chops if you like lambs it would be delicious!